How time flies! September is coming to the second weekend! Outside is cold and going to rainy days. 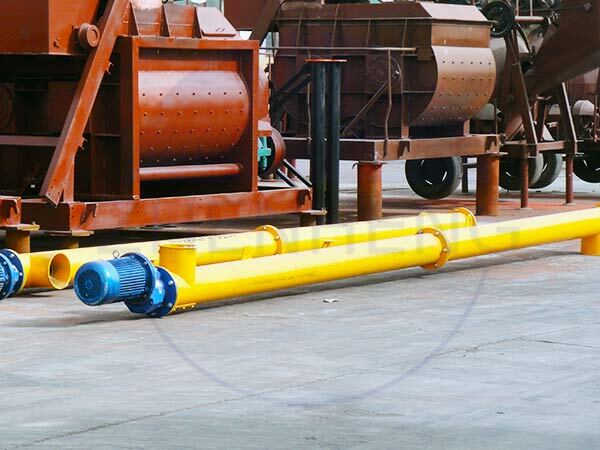 I m glad our Mongolia customer order our screw conveyor with dia 219 and length 12m for his concrete batching plant. Zhengzhou Construction Equipment Co., Ltd, Our products mainly include concrete batching plant from 25m3/h to 180m3/h; JS series twin shaft powerful mixer JS500, JS750, JS100, JS1500, JS 2000; JDC series single shaft mixer; JZM series from JZM350 to JZM750 concrete mixer which adopts rubber roller friction; JZC and JZCP series adopt gearing driving method; JZR series adopts diesel power which is suitable for electric lacking areas; PLD/PLB concrete batching machine and so on. Screw conveyor is one of important accessory equipment for concrete batching plant , block making production line such as construction site for transportation raw materials to main equipment and form a complete production line. Here are mainly two way for calculating its length when customer asked for the parameter. One way is the total length including motor and reducer. The other way is from feeding month to discharging month. Once the customers need to confirm a certain machine, please offer more details about your requirements for diameter and length correctly; besides, if you can offer site flow chart, the more suitable plan can be matched with motor and anger!